Who is Sheldon and why is he such a lucky canine? It would appear one needs to be fortunate even when born an adorable dog. 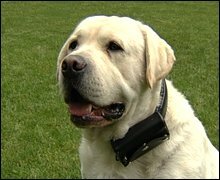 A Labrador named Sheldon just happens to be the nephew of a dog named Koni who belongs to Vladimir Putin, the current Prime Minister of Russia. He is the first animal to wear this special device, which will allow dog-lovers to easily track their pets via a global navigational satellite system (GLONASS). How does this pet-tracking, global navigational satellite system work? The dog accessory is made of expensive black leather and comes in three varieties each with their own battery capacity. The special pet collar is specifically designed to track a dog’s movements online by utilizing data supplied to the owner’s pocket PC, notebook or communicator. When will these new collars be available for mass production? The designers of the world’s first animal tracker say mass production of these collars will not begin until they can be assured of a steady demand for the product. It is estimated that the cost of each tracker will be around $500 US dollars, which may limit purchasing to the rich dogs of the world and their even richer owners!